Before the Wu Tang Clan, Shaolin NYC and Bruce Leeroy. Before Chris Tucker and Jackie Chan. Before all those hybrid black and Japanese creations that, for me, culminated in Afro Samurai, there was The Black Dragon, Ron Van Clief. Van Clief was the first black star of a kungfu flick in the golden age of kungfu flicks. But it wasn’t just the movies that got kids involved—although watching hundreds of Hong Kong martial epics definitely helped. 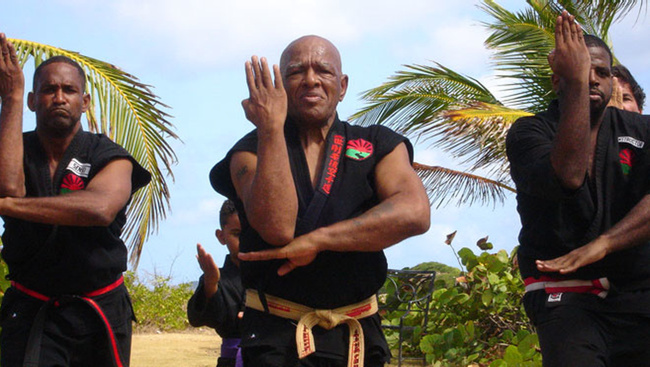 Van Clief’s journey into the martial arts was one many black men and women took as they embraced the disciplined self-defense systems of the East in order to cope with the oppression and injustice of 1960s America. At the time, black men were still targeted in racial violence, and the Civil Rights Movement was doing in the 60s what Gandhi’s Salt March did in the 30s—taking beatings in the name of freedom. Kungfu was an escape from powerlessness, a community builder, and a reaction to a series of breathless victories and traumatic defeats of the time. When Martin Luther King was shot—following the Kennedy assassinations and widespread violence against voters in the South—martial arts was one way to cope. Kungfu flicks in the theaters of the US’s black neighborhoods brought tales of righteous individuals facing down institutionalized corruption, greed, and class-based injustice. The image of a martial artist beating down evil men and saving the day must have appealed to kids who had to deal with the same evils every day, with no real end in sight. This story is told in a documentary, The Black Kungfu Experience, which draws heavily upon the stories of four prominent Black kungfu practitioners and teachers: Van Clief, Dennis Brown, Donald Hamby, and Oso Tayari Casel. All of the men faced incredible obstacles, and Van Clief’s story in particular—as a Marine facing a lynch mob in North Carolina and racist officers in Vietnam—brings home the struggle these men went through just to survive. Casel is fascinating as well, specifically for his unique mixture of African and Chinese martial traditions. He has made martial arts his own mode of expression, through drum circles and high-kicks, dreadlocks and monks’ robes, and his school as portrayed in the film is a more radical attempt to Africanize kungfu, rather than be just the dojo of black kungfu guys. The first movies featuring black martial artists appeared in the early 1960s—The Black Dragon being the most famous at the time—and those flicks paved the way for hundreds more. Blaxploitation films borrowed heavily from the lone martial artist/badass taking on an army of foes; hip hop embraced the martial themes as well, establishing a veritable Temple of Hip Hop in the 1990s and infusing rap lyrics with a rich, new lexicon. Despite the vast gulf between African and Asian cultures, there is something so familiar about watching a man with an Afro do kungfu. It truly is a case of opposites attracting, and creating something new and appealing. The Wu Tang Clan expressed this fusion for the current generation, and although black lives in NYC seem on the surface so far removed from the dubbed samurai flics and sword-style references embedded in the Wu’s lyrics, it just fits right. When asked to explain the curious ability of the two cultures to fuse over martial arts, the men in the documentary bring up a few different points. The basic need for Black men to be able to defend themselves. The style and grace of Eastern martial arts, so akin to dance, and so close to traditional African expression through body movement. Rhythm, and freedom. Even when Chinese martial artists sneered at their black compatriots—for being black, or for being ignorant of Chinese terms—all it took to overcome the prejudice was skill. Hard work paid off, and for black people in America, where institutionalized racism still divides our experiences, kungfu helped.